Popping up into a handstand is easy. All you need is straight, strong arms and up you go. I used to do them easily. But then I developed chronic nerve pain in one of my legs, and going up was out of the question. I avoided them for years in yoga class. When my symptoms healed and it was time to go up, fear took over. All I could think of was buckling, which I did, again and again. 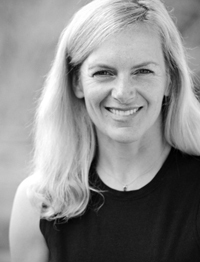 In "Fierce Medicine," author and yoga pioneer Ana Forrest writes about a "brave-hearted path." What if we became the hunter, and tracked down our fear, to turn from prey to predator? What if we let go of the old stories that hold us back and make a very small change? For most of us, small changes are realistic and attainable. The next time I tried a handstand, I tracked down the fear (have fun! ), and up I popped, exhilarated! All it took was one small change in a very brief amount of time. When it comes to your health, tiny steps can help change a laundry list of habits. ( Access readiness: Motivation has to come from within. Ask yourself what is the real objective you are after. Keep asking "why." Uncovering the real reason of saying "I want to lose weight" with further prodding might really be that you want to have more energy and not miss out on hiking in the Pioneers next spring with friends. ( Set your intent: Instead of waking up, tossing some coffee down our throats and rushing headlong into our day, Forrest suggests that we set our intent, and not make it overwhelming. Make one change that appeals most to you. If you are tired of a stiff neck from sitting at your computer, you might add 10 big shoulder rolls in each direction every hour that you spend at your desk that day. Schedule a long-overdue massage. If it's out of control eating that bothers you, promise yourself to sit at the table every time you eat. ( Small-enough steps: Everyone knows it's a good idea to park your car farther from where you need to be. Not only are the extra steps good for you, but it's also a time when you can take notice of the day. For those few moments, appreciate the environment you live in, the sun or even the lack of traffic that day, and be grateful for that. Instead of feeling guilty about not getting on the treadmill for an hour, try just 10 minutes. You'll be energized by the effort, and may even stay on it longer than you'd thought you would. ( Nip an unhealthy habit in the bud: As you strive to make health-enhancing resolutions materialize, Edward Philips, editor of the Harvard Health School Report, recommends taking a good look at any unhealthy habits that you can't seem to shake. A daily diet of cookies for lunch could wreak havoc on your energy later in the day. Likewise, excessive amounts of time surfing online, for example, can leave you less opportunity to engage in healthier pursuits, such as deepening social ties, or a walk. Your day-to-day choices, no matter if it's practicing handstands or healthier eating, all count to help bring vitality and well-being in the new year. Connie Aronson is a fitness specialist at the Wood River Community YMCA in Ketchum.